Traveling to Basque Country? This can be the right spot on the internet to locate places to swim in Basque Country. Each day you're not swimming you might be losing precious time in improving your expertise to be a greater swimmer! No more excuses! Come across your nearest Basque Country Pool and tell us how it went. For Basque Country and its vicinity, we're showing you all the registered pools, some of them have no GPS coordinates and cannot be found on the map at the map. Do you know of any Pools in Spain that should be listed here? Contact us!. Regular users in the following Basque Country Pools told us the most very important point about swimming is always to control your breathing. At times this is not attainable because we raise the neck to breathe and the body is not aligned. To avoid this, our head needs to be aligned with our spine all of the time. Swimia.com wants your feedback on Aquagym in Basque Country to ensure all the information about swimming in Basque Country is valid. Before trying any pool, be sure you know the rules and regulations for Basque Country Pools as they may not be the identical as in your residence town. We advocate you make contact with the pool directly to ask in case you will require a hat, and what style of footwear or specific clothing you will need. If you're tired of getting eyes and irritated skin, finding a saltwater pool in Basque Country can be the remedy. You ought to know that the level of salt from these pools is effectively below the level of salt from sea water, specifically they're talking about a tenth or less. One of the advantages of outdoor swimming in Basque Country is the possibility to sunbathe throughout the summer season. Taking it with extra care, sunbathing is healthy given that introduces Vitamin D into the body, so the most effective selection seems to be switching between indoor and outdoor pools depending on the season. Enjoy the best indoor pools in Basque Country and don't worry about the weather. These facilities are open all seasons and you can enjoy a swim at the same temperature every day of the year. 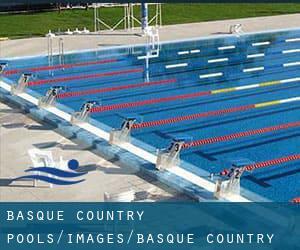 There are numerous reasons why you should choose a heated swimming pool in Basque Country. One of the most important one relies on the importance of keeping the body temperature stable. If the water is too cold, your body will try to warm it up and you will lose strength to swim effectively. There are quite a few alternative remedies to chlorination, with great advantages that make certain far better water top quality in the pool. A single possibility may be the mineralizer, which purifies water naturally and significantly decreases the chemicals applied and maintenance time. Try Chlorine Free pools in Basque Country. Swimming is often a excellent concept to keep your body active in the course of your visit to Bilbao (Basque Country), or even if you are a local. Swimia helps you to discover your closest Swimming Pool in Bilbao. Whereas Barakaldo is one of the six most populous cities in Basque Country with nearly 98.460 residents, you shouldn't miss that one if you're going to Basque Country. Without a shadow of a doubt, swimming in San Sebastian may be the finest way to unwind following work. Take a couple of minutes to browse Swimia's catalog to find a Swimming Pool in San Sebastian. Holding an estimated population of 235.661, Vitoria-Gasteiz is one of the most important cities in Basque Country. Check all of the Swimming Pool in Vitoria-Gasteiz and its surrounding area. Updated on 2019 Landaverde, 31 , Vitoria (Gasteiz) , Spain (Postal Code: 01010). Swimmers like you reported 25 meters x 10 meters, 5 lanes, 1.4 meters - 1.7 meters depth, 1.4 meters - 1.7 meters depth, Indoors. Phone number and e-mail address are number for this Pool. Updated on 2019 Calle Particular de Iturribide, 78 , Bilbao , Spain (Postal Code: 48006). Swimmers like you reported 25 meters x 10 meters, Indoors. Unfortunately we do not have the email address of this Pool, but we can provide you with the phone number. Updated on 2019 Learreta Markina, 3 , Berriz , Spain (Postal Code: 48240). This sports center offers 25 meters x 12.5 meters, 6 lanes, Indoors. Contact info for this Swimming Pool such as phone number and email address are number. Updated on 2019 Felix Gabilondo , San Sebastian (Donostia) , Spain (Postal Code: 20015). Among all the activities offered by the center, if you are considering swimming you will get pleasure from 25 meters, 6 lanes, Indoors. Just in case you wish to contact this Pool before dropping by, we only know the phone number. Updated on 2019 Jon Arrospide 1 , Barrio de Deusto , Bilbao , Spain (Postal Code: 48014). Swimmers like you reported 25 meters x 10 meters, 1.8 meters - 2.5 meters depth, 1.8 meters - 2.5 meters depth, Indoors. Unfortunately we do not have the e-mail address of this Swimming Pool, but we can provide you with the phone number. Updated on 2019 Calle Hermogenes Rojo, 1 , Bilbao , Spain (Postal Code: 48013). Among all the activities offered by the center, if you are thinking about swimming you will enjoy 25 meters x 12 meters, 6 lanes, Indoors. Just in case you wish to contact this Swimming Pool just before dropping by, we only know the phone number. Updated on 2019 Arripausueta auzunea 3 , Durango , Spain (Postal Code: 48200). Swimmers like you have reported 25 meters x 12 meters, 6 lanes, Indoors. Also, you will find 25 meters x 12 meters, 6 lanes, Indoors. Just in case you want to make contact with this Pool before dropping by, we only know the phone number. Updated on 2019 C/ José Luis Compañón, 1 , Vitoria (Gasteiz) , Spain (Postal Code: 01007). This great and large sports center lets professional swimmers like you enjoy Olympic size x 25 meters, 10 lanes, 1.6 meters - 2 meters depth, 1.6 meters - 2 meters depth, Indoors. Additionally, within these facilities you can try 20 meters x 6.3 meters, Indoors. Phone number and email address are number for this Swimming Pool. Updated on 2019 Barrio de Arene s/n , Bermeo , Spain (Postal Code: 48370). This sports center gives 25 meters x 10.5 meters, 5lanes, Indoors. Contact information for this Swimming Pool for instance phone number and email address are number. Updated on 2019 Cendeja 29B , Muskiz , Spain (Postal Code: 48550). Swimmers like you reported 25 meters x 12.5 meters, 4 lanes, 1.8 meters - 2.5 meters depth, 1.8 meters - 2.5 meters depth, Indoors. Unfortunately we do not have the email address of this Swimming Pool, but we can give you the phone number. Updated on 2019 Barrio Sarriena, 173 , Leioa , Spain (Postal Code: 48940). Swimmers like you reported 25 meters x 12 meters, 1.8 meters - 2.5 meters depth, 1.8 meters - 2.5 meters depth, Indoors. Phone number and e-mail address are number for this Pool. Updated on 2019 Goiherri-Martiartu Errepidea, 7 , Erandio , Spain (Postal Code: 48950). Among all of the activities offered by the center, if you are interested in swimming you are going to delight in 25 meters x 12 meters, 6 lanes, 1.8 meters - 2.5 meters depth, 1.8 meters - 2.5 meters depth, Indoors. Just in case you need to contact this Swimming Pool before dropping by, we only know the phone number. Updated on 2019 Bizkai Kalea, 42 , Galdakao , Spain (Postal Code: 48960). Swimmers like you reported 25 meters x 17 meters, 8 lanes, Indoors. Unfortunately we do not have the email address of this Pool, but we can give you the phone number. Updated on 2019 Vega La Punta, 1 , Barakaldo , Spain (Postal Code: 48901). Among all the activities offered by the center, should you be considering swimming you might delight in 25 meters x 16.67 meters, 8 lanes, 1.8 meters - 2.2 meters depth, 1.8 meters - 2.2 meters depth, Indoors. If you should contact this Swimming Pool, email address and phone number are both number. Updated on 2019 Calle de La Ribera, 3-F , Vitoria (Gasteiz) , Spain (Postal Code: 01013). Among all the activities supplied by the center, for anyone who is interested in swimming you'll take pleasure in 25 meters x 12.5 meters, 6 lanes, 1.6 meters - 2 meters depth, 1.6 meters - 2 meters depth, Indoors. If you'll want to contact this Swimming Pool, email address and phone number are both number.